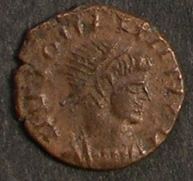 John Kent, author of RIC VIII on the coins of the family of Constantine, thinks that very few coins were issued 340 - 348, that is, from the death of Constantine II to the FEL TEMP REPARATIO reform of 348. The most common type in the west is next. RIC Siscia 195, page 363, "AD 347-348". 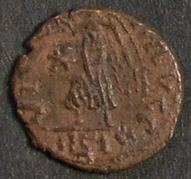 This type was issued from all western mints to as far east as Thessalonica. 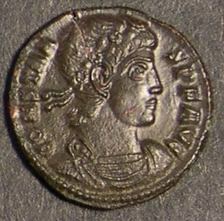 This reverse was issued for Constans and Constantius II, but is more common for Constans, who was the western emperor. 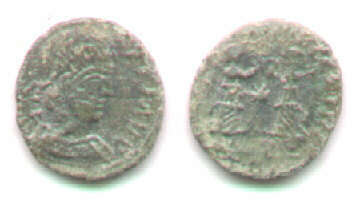 Large hoards of coins from the east demonstate that imitations were far less common in the east. However, this type was imitated in Britain. Its imitations are scarce, possibly because there was little time between its issuance and the major FEL TEMP REPARATIO coin reform which produced its own flood of imitations. Reasonably bold imitation is crude style. This imitation and the next are cruder than the two illustrated examples in Bastien, ANSMN 30 (1985) numbers 25 and 26. Thin and weakly struck imitation. Prototype: RIC Trier 180-211, p. 151-2. Nearly official style prototype. Only a few features determine this to be an imitation. CONSTA-S PF NO C, diademed head right. 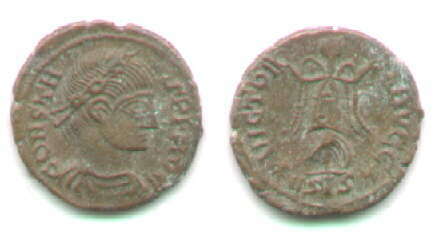 Note the obverse is missing the "N" of CONSTANS. Prototype: RIC Siscia 175 of AD 347, "16-17 mm, 1.67 grams"
From a dealer in Spain. 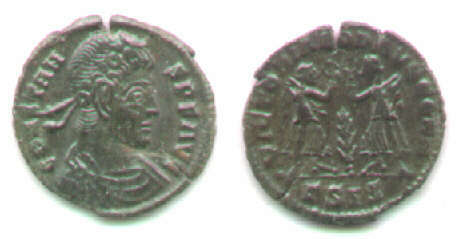 Constans, AE13 imitation, 5:00, 1.25 grams, of a prototype AE16, 6:00, 1.59 grams. 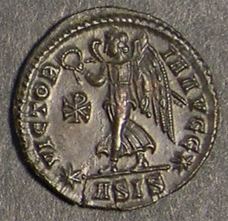 VICTORIA AVGG, *ASIS* mintmark, Victory with wreath and palm, advancing left, chi-rho in left field. 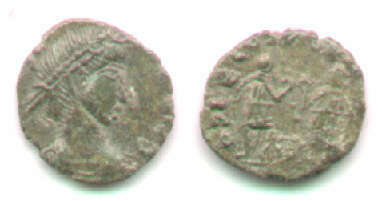 RIC VIII Siscia 177, page 362, plate 16.176, "340-348 AD"
The imitation is significantly smaller and cruder, but recognizable. Continue with FEL TEMP REPARATIO imitations. Return to the first page on imitations of 330-340.